This set features our studio-size 40 ml. cakes of Encaustic for you to experiment with and comes packaged in Ampersands cradled 6 x 6 Encausticbordï¿½. The translucent colors allow you to achieve beautiful glazes. 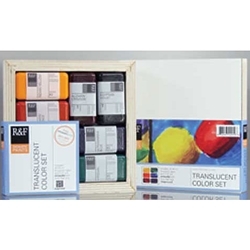 The set contains: Alizarin Orange, Alizarin Crimson, Egyptian Violet, Indian Yellow, Ultramarine Blue and Viridian.